The European DevDays organised by the European Commission, is the leading European forum where the questions and issues about international development cooperation are debated. Inspired by its founding principle of solidarity, the European Union has joined forces with its Member States to make 2010 the European Year For Combating Poverty and Social Exclusion. The key objectives are to raise public awareness about these issues and renew the political commitment of the EU and its Member States to combat poverty and social exclusion. This multilingual (23 languages) application is associated to the EC European Year. That year was focused on “Combating Poverty and Social Exclusion”. EYAP 2010.
.: For Diversity. Against Discrimination. The Stop-Discrimination campaign provides information on discrimination and diversity issues It is aimed at the general public as well as stakeholders such as employers and people working in the field of equality. This multilingual (23 languages) application is hosted on the Europa Servers. 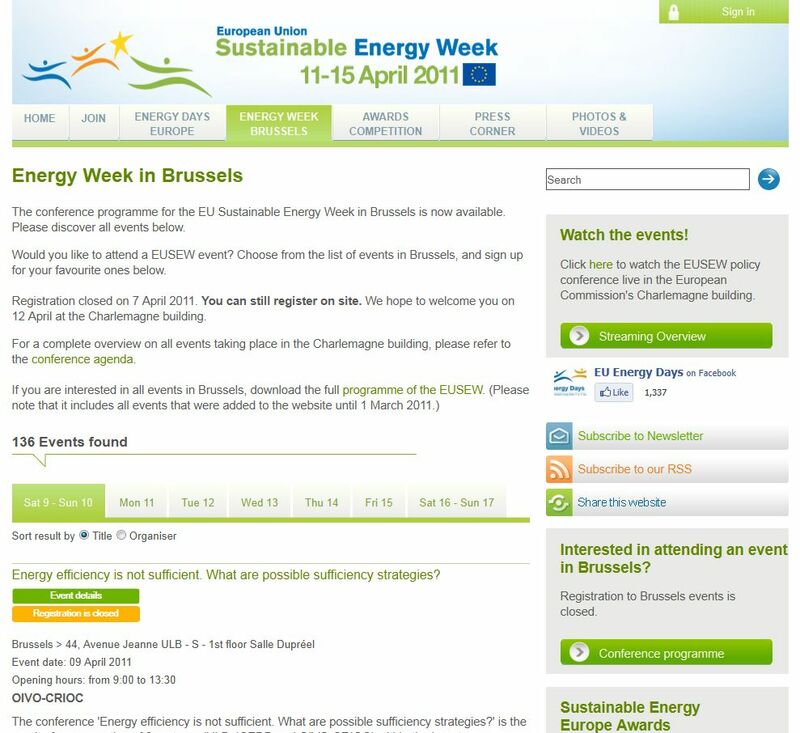 The Sustainable Energy Europe Campaign showcases activities dedicated to energy efficiency and renewable energy solutions. 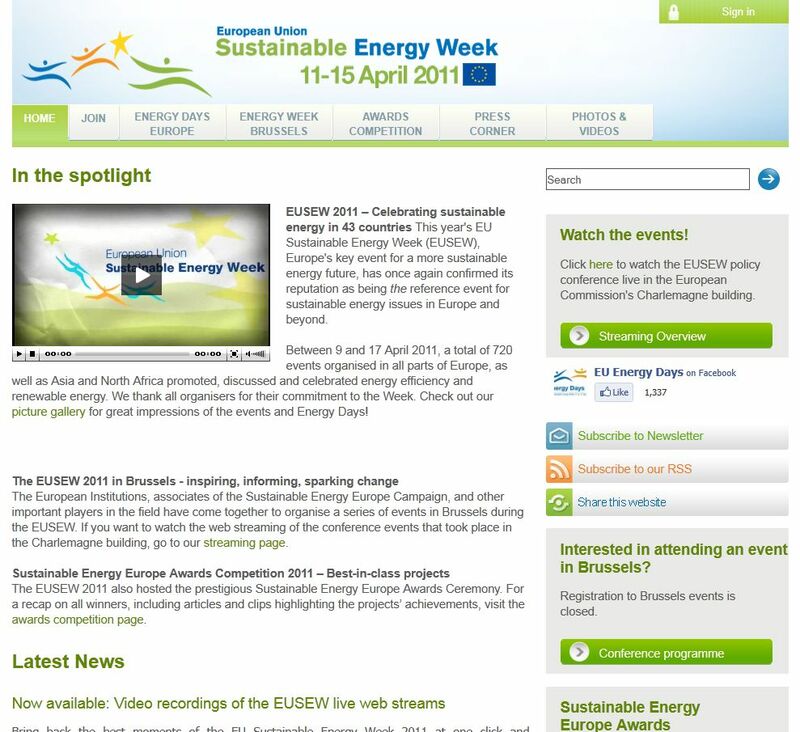 “EUSEW” is the major annual event of the Sustainable Campaign. 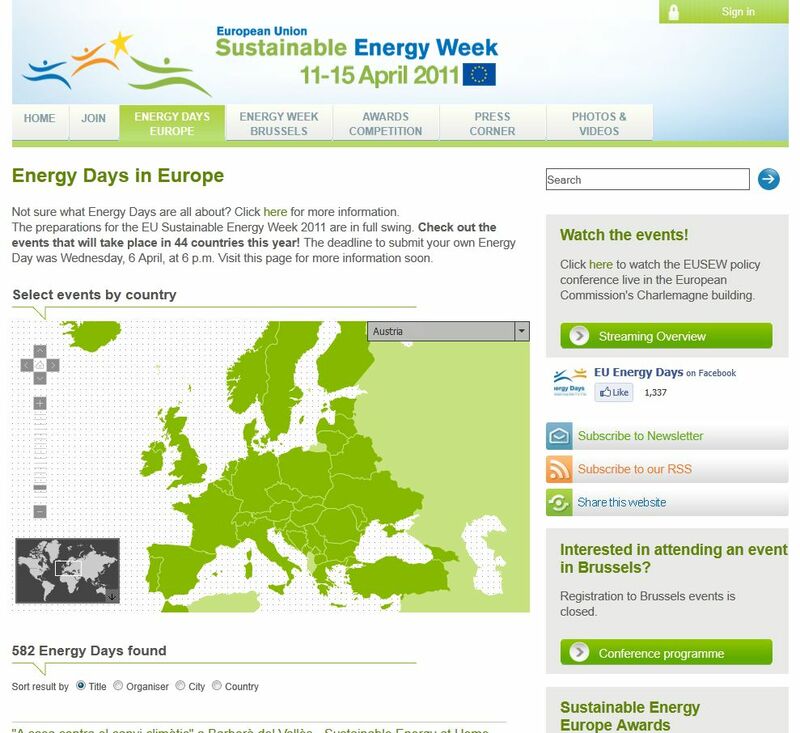 It occurs once a year in Brussels, celebrating sustainable energy in 43 countries. 2010 EU Sustainable Energy Week (EUSEW), Europe's key event for a more sustainable energy future, has once again confirmed its reputation as being the reference event for sustainable energy issues in Europe and beyond. This website focuses on special events which take place during the week. In order to avoid redundancy and to ease the management, we have setup a common database with the Sustainable Energy website. Users were entitled to create accounts, upload projects and events, and manage the registration process to the event. 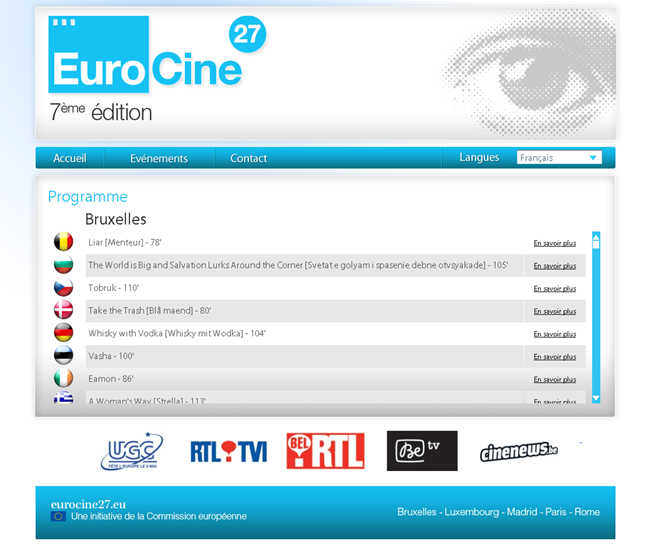 The TVLINK Europe is a video on-line distribution platform designed to meet the needs of audiovisual journalists by helping them to provide better coverage of European issues. The site enables journalists to illustrate European subjects through the distribution of video reports that can be obtained directly on-line. These video reports are also accompanied by a full description of the images used in each film, transcripts of the commentary and interviews. 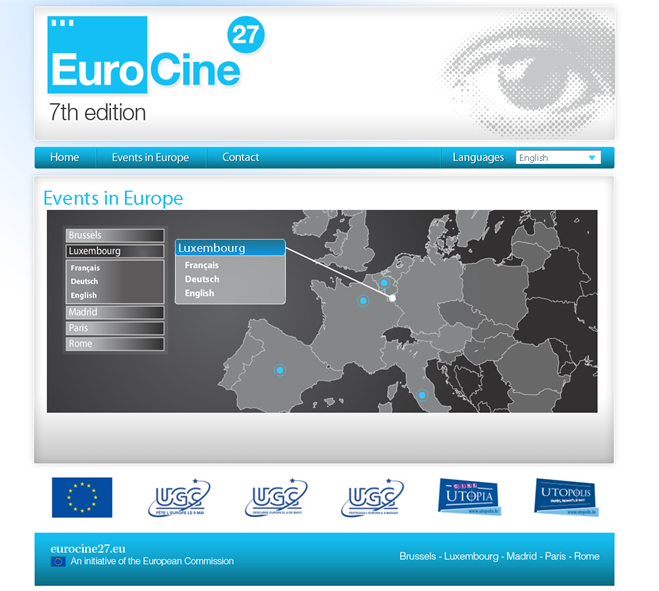 Eurocine27 presents films from the 27 Member States of the European Union. The films are shown in certain cinemas of the Europa Cinemas network, taking the opportunity to celebrate the diversity and depth of filmmaking talent throughout the European Union. For this website, due to the extremely tight deadline and the lack of validated functionalities, we have chosen a pure HTML approach. So by carefully creating and duplicating template pages, using a very precise standardised coding and comments, it has been very easy to insert and/or replace the needed content using "regular expressions". The website was multilingual (23 languages), and made of about 500 pages, 200 trailers, and more associated content. 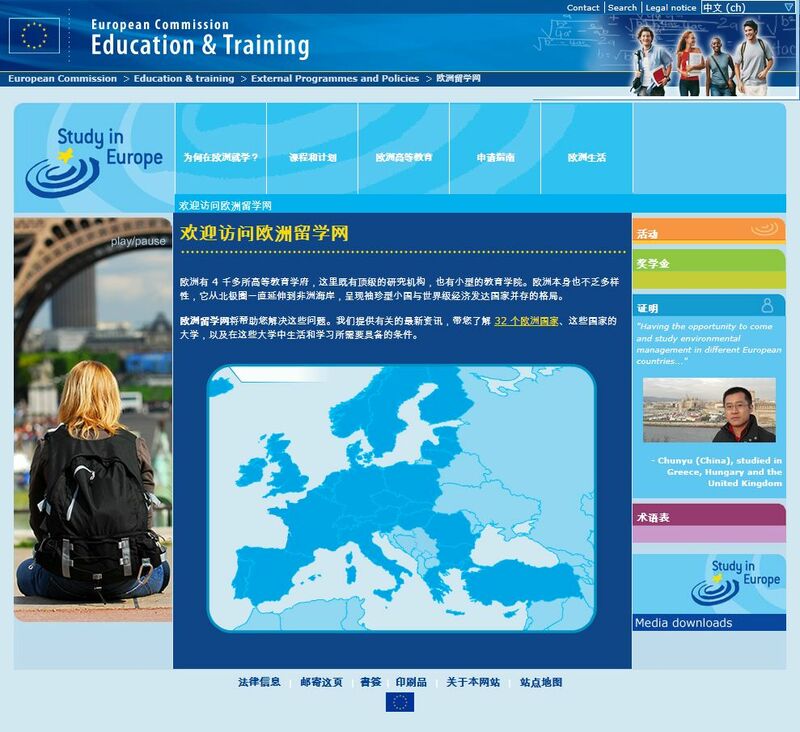 "Study In Europe" is a multilingual website associated to a worldwide campaign. ArtSolution established in 1999, is specialised in providing quality, dynamic and secure websites for "Antiques" dealers, fairs and institutions. Being specialised in the Art Market helps the company better understand needs and requirements of its "niche" market. Based on many years of experience ArtSolution also provides consulting on web strategy. SmartConcept has taken a decisive role in 2007 by re-organising the development team of the company, and is now managing the IT of the current and new projects. MasterArt.com is a unique and exclusive website grouping thousands artworks from about 2500 masters of the last centuries. All artworks are available for sale by the finest antiques dealers referenced by the website. Active collectors can request alerts in order to be informed about new masterpieces available on the platform which match refined search criteria. ArtSolution is now providing its customers with the most efficient solution in the mobile world.